The Eichlers on Stanford campus span three decades and four different architects and include a variety of models. Here are three prime examples: Top: A 1951 Anshen and Allen flat-top. Middle: This Eichler, designed by Pietro Belluschi, was based on his 1958 ‘Life house’ built in the San Mateo Highlands. Bottom: A 1970-era Claude Oakland model. Houses on campus are as likely to be torn down as any houses in Palo Alto, where prosperous buyers often want more living space and could care less about historic design. A house on campus designed by Joe Esherick was recently demolished. 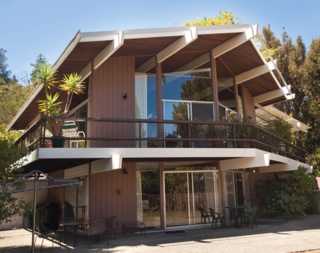 A similar fate could have befallen a lovely and unusual Eichler, designed by John Brooks Boyd. The home, with glass front and back, maintains privacy thanks to a garden wall that faces the street and functions as the home's front façade. The home has just been restored. “A lot of people said when we bought the house, ‘Oh you're going to tear it down and build a 5,000-square-foot house?' I said, no, we're going to keep it,” says Carolyn Piotroski, whose husband Joseph is at the business school. The house, which had fallen into disrepair and had heating ducts crawling across the roof, required the Piotroskis to strip it to its studs, with the couple doing much of the work themselves. The couple brought in professionals to remove the ducts, reconnect the radiant heat, and repair the holes in the ceiling that had accommodated the vents. Carolyn found just the right 'six-inch tongue- and-groove' to match the original ceiling, and spent hours finding just the right stain. “We worked hard to stick to the spirit of the house and not have John Brooks Boyd roll over in his grave,” she says. As part of her job for the university, Laura Jones, director of heritage services, reviews architectural changes in homes, as an advisor to Faculty Staff Housing, which oversees Stanford's residential properties. New owners often come to Jones asking what sort of changes they can make in their modern homes. Can they turn a carport into a garage? Push out the living space to the ends of the eaves? Add a second story? “I'm trying to discourage people from changing the style of the house when they remodel,” Jones says. 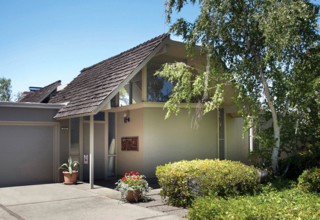 • The 100 or so Stanford Eichlers are located throughout the residential district of the campus. A cluster can be found in the neighborhood that includes Cathcart Way, Allardice Way, Raimundo Way, Cottrell Way, Vernier Place, Wing Place, and Tolman Drive. More are on Cedro Way, Valdez Place, Mayfield Avenue, Casanueva Place, and Lathrop Drive. Frenchman's Road has several—as well as Frank Lloyd Wright's Hanna house, which can be toured by appointment. Somewhat closer to the campus proper, Eichlers stand on Esplanada Way, Santa Fe Avenue, Pine Hill Court, Mears Court, and San Francisco Terrace and Court. They're also on Gerona Road and Junipero Serra Boulevard, but hard to view there.